Looking for an in-depth, high school course that will provide a strong foundation in Latin grammar? Would it be even better to find one that includes historical background from a Christian perspective, too? You’re in luck! I’ve been blessed to use Latin in the Christian Trivium, Volume I with my high school daughter this year. The course has been easy for me to teach and intriguing for my daughter to use. I have a beginner’s background in Latin, but would not have needed it to teach this course. Both the student textbook and teacher’s guide provide thorough, yet concise, teaching notes so you and your student have all you need to complete the lessons. For students who appreciate more than cut and dry daily exercises, or those who need additional practice, an activity book is available which includes oodles of extra fun for each chapter. Logic puzzles, mazes, word searches, crossword puzzles, matching, timelines, music, flashcards and scavenger hunts are just some of the exciting reinforcement activities you’ll find tucked into this book! Another book of study and drill sheets is available as well. For each chapter, there is a study sheet to help students prepare for chapter tests. Many chapters also include drill sheets which require Latin translations learned from the text. These have proven to be very helpful in our homeschool. In addition to the full student text and answer keys for everything, the teacher’s guide also includes a course syllabus, chapter objectives, teaching notes, and a plan of study for each chapter. A resource CD is included that supplies test masters and large maps that can be used on an overhead if you happen to use the course in a classroom setting. The teacher’s guide is absolutely necessary! A Pronunciation CD is also available to help you learn to correctly pronounce all the vocabulary and reading lessons. Very helpful! We have been super-pleased with this course and will be looking into Volumes II, III & IV soon! -Cindy is an eclectic Charlotte Mason mom of 3 from Central KY. You can find her blogging at Our Journey Westward and find her NaturExplorers curriculum at Shining Dawn Books. 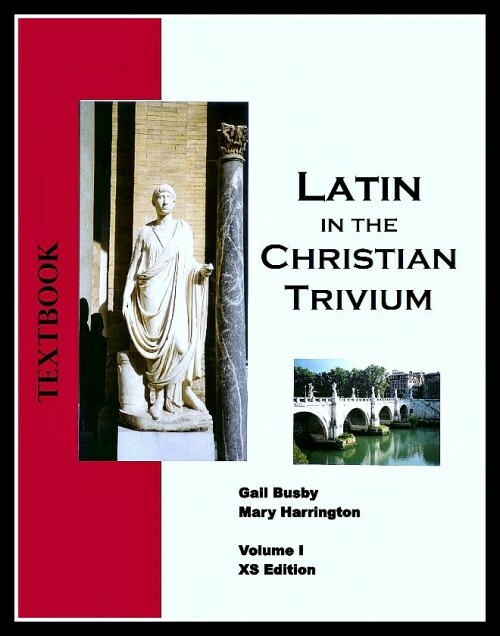 Cindy received a free copy of Latin in the Christian Trivium in exchange for an honest review. Do students need any prior knowledge of Latin to use this curriculum?